That's the pitiful plight of the child named Ho Nguyen Tuong Vy - daughter of Nguyen Thi Nga (33 years olds, Dien Thang Nam Commune); this little child had marble bone disease when she was 4 months old. When Vy was born, she was as normal as others. But when she was 4 months old, Vy was usually sick, short of breath, pale skin, cried at night, and had fever constantly. Every day, Mrs. Nga always goes to the communal healthcare station or district hospital to ask for a prescription for her daughter. However, her daughter’s disease just ended for a short time. Four months later, the disease was worse and worse, the family sent her to Da Nang Maternity and Pediatric Hospital. 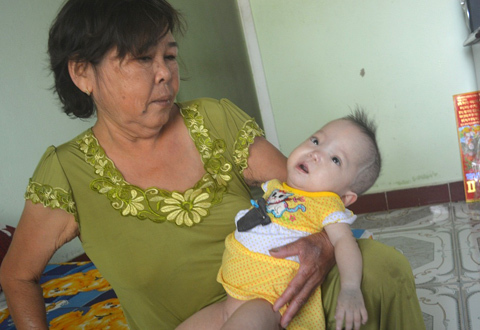 More than a week later, the doctor requested that the baby be sent to Ho Chi Minh City for special treatment. The baby was then concluded to have marble bone disease by HCMC hospital. Her red and white blood cells, and platelets are abnormal, the blood itself cannot replicate. Therefore, she must be sent to Da Nang to receive blood transfusion 2-3 times/month. Vy’s health gets worse and worse day after day while her family is too poor to pay for her treatment. The family really needs the community’s help.